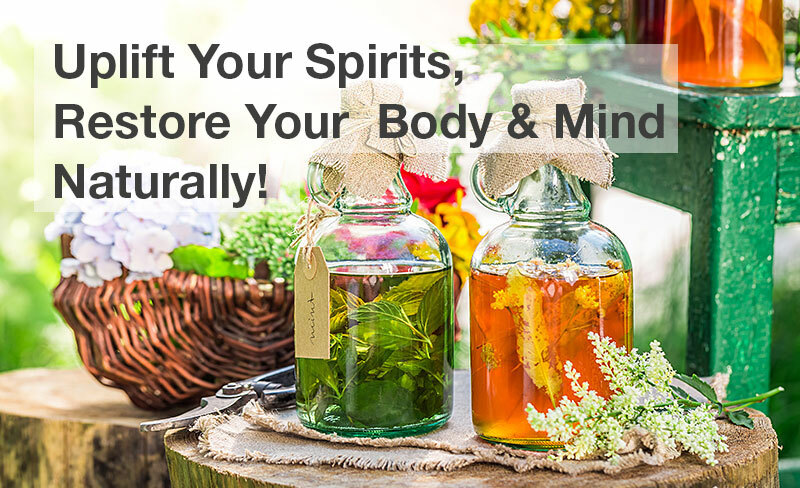 Uplift Your Spirits, Restore Your Body & Mind Naturally! This recipe tastes great with cinnamon added, but if you are drinking it daily, add the cinnamon only occasionally, as it’s too strong and drying to use every day. 1. Add the burdock root to boiling water, reduce heat, and simmer for 15 to 20 minutes in a covered pot. 2. Turn off the heat and add the rest of the herbs. 3. Stir well, cover, and steep 15 to 20 minutes. This is a superior, vitamin-rich booster for daily health enhancement, this blend is absolutely delightful. 1. Combine all the herbs in a pot and pour boiling water over. 2. Stir well, cover, and steep 15 to 20 minutes. This blend is extremely effective if taken in frequent doses before bedtime. It will be quite bitter due to the hops; you may wish to tincture it, in which case increase the amount of hops and valerian. 1 part passionflower 1 part valerian part hops Combine the herbs. 3. Take small, frequent doses of the formula starting about 3 hours before bedtime. Nerve formula for depression and grief. You can adjust the herbs in whatever proportions work best for you, and sweeten with honey to taste. 1 part St. John’s wort Mix the herbs. 2. Stir well, cover, and steep 15 to 20 minutes. Drink 3–4 cups daily, or as often as needed. Drink this mineral-rich blend often to support the heart and blood, liver, and nerves. 1. First decoct the dandelion root for 30 minutes, simmering over low heat. 2. Remove from the heat and add the other herbs. 3. Stir well, cover, and steep 10 to 15 minutes. This tincture is an excellent remedy for nerve stress and debility. 1. Place the herbs in a wide-mouth jar. Add enough brandy or vodka to completely cover the herbs by 2–3 inches. Cover the jar tightly and place in a warm (about 85°F), shaded area. 2. Let sit for 4–6 weeks, shaking occasionally to prevent the herbs from settling on the bottom. Strain and rebottle for use. Take 1⁄2–1 teaspoon 3 times a day. This tea is delicious iced or hot and can be enjoyed daily. It’s wonderfully nourishing and supportive, toning and strengthening the whole nervous system. 1. Combine all the herbs in a pot and cover with boiling water. 2. Stir well, cover, and steep 15 to 20 minutes. Steeping the rose hips preserves the vitamin C better than decocting does. Melissa, or lemon balm, is a wonderfully relaxing yet gently stimulating herb. It increases energy in the system by helping to release energy blocks and stress. 1 part St. John’s wort Combine the herbs. 2. Stir well, cover, and steep 15 to 20 minutes. Drink at least 2–3 cups daily, or as needed. A relaxing, tasty evening drink, chamomile tisane gently soothes irritated nerve endings and eases away the day’s tension. Chamomile is a good source of tryptophan and helps relieve anxiety and tension. 1 part skullcap Combine the herbs. 2. Stir well, cover, and steep 15 to 20 minutes. Drink as much and as often as needed. Try this tea for that type of depression in which anxiety and stress rear their ugly heads. 3. Add the tincture to the last few sips of your tea, up to four times per day. This is a very soothing nervine tea, perfect for infants and children to help soothe the cares of the day. 1 part chamomile Combine the herbs. This blend is both relaxing and nourishing to the nerves and heart. The Chinese believe that the heart is the home of the shen, or spirit, and that insomnia is caused by the “restless wanderings of the shen.” By nourishing the heart, the shen is more likely to find its desired place of rest. A takeoff on an old traditional herbal recipe, this tea is for those times when you feel the cold or flu just getting ready to lay siege to your body. It’s warming, diaphoretic, and antiviral. Take this unique and powerful antiviral, antibacterial tea three to five times per day for maximum benefit. 1. Add the ginger and rose hips to boiling water, reduce heat, and gently simmer for 5 to 10 minutes. 2. Turn off the heat, add the remaining herbs, and steep, covered, 15 to 20 minutes. Add the tinctures to the last few sips of the tea. Use this great tonic for blood-building during pre- and postnatal times and also during PMS and menopause. Make it once or twice a year, then imbibe several times a week as a blood-enriching, iron and mineral boost. It will keep for several months if refrigerated. 1. Add all the herbs and fruits to boiling water (1 quart per 1 ounce of herbs), reduce heat, and simmer for 2 hours, covered. 2. Remove from the heat and allow to steep 2 hours, covered, stirring occasionally. 3. Strain out all the solids, squeezing all liquid through cheesecloth. 4. Measure the volume of tea, then add half to three quarters as much molasses, ¼ part brandy (to preserve), and a couple of dashes of raspberry vinegar. 5. Keep refrigerated, taking 1 to 2 tablespoons (15–30 ml) as needed. Note: If you can’t find raspberry vinegar in a store, you can make your own using 1 cup (237 ml) crushed, fresh or frozen raspberries infused overnight in 2 cups (474 ml) white wine vinegar. Wonderful for balancing and strengthening the female being, this formula supports the hormonal and glandular systems. It’s yummy and nourishing and can be made as a tea or tinctured in brandy. As a tea, drink one to two cups daily. As an elixir, take 1 to 2 dropperfuls two to four times per day. 1. Add all the herbs to boiling water, reduce heat, and simmer for 15 to 20 minutes in a covered pot. 2. Turn off the heat and steep, covered, 15 to 20 minutes. 1. Add all herbs to boiling water, reduce heat, and simmer for 40 minutes in a covered pot. Then turn off the heat and steep 20 minutes. 2. Strain, squeezing all the excess liquid from the herbs. 3. Measure the volume of the infused liquid, then add half to three quarters as much molasses and ¼ part brandy. Here’s a great tonic for overall energy, stamina, and mental clarity. The hawthorn nourishes the heart, the dandelion tones the liver and digestive system, and the ginseng, sarsaparilla, and licorice nourish the adrenals and male glandular system. Drink half a cup twice per day. 1. Add all the herbs to boiling water, reduce heat, and simmer in a covered pot for 20 minutes. 2. Remove from the heat and steep, covered, 30 minutes. This heart-nourishing formula has the classic tonic actions of hawthorn, combined with the strengthening properties of rose hips and ginkgo. Siberian ginseng safely helps the body adapt to stress and strengthens adrenal and glandular body functions. Nettle is one of the best blood and adrenal nourishers, rich in chlorophyll, beta-carotene, vitamin C, and iron. This gentle, yet effective, strengthening tea for overall heart health can also be used by anyone who is recovering from a heart attack. 1. Add the hawthorn berries and ginseng root to boiling water, reduce heat, and simmer for 20 minutes in a covered pot. 2. Remove from the heat and add the remaining herbs. 3. Steep, covered, 15 to 20 minutes. An excellent tea for relaxing and nourishing the heart and cardiovascular system, this formula is particularly valuable in easing angina. Hawthorn and ginkgo provide cardio-tonic, and motherwort brings cardio-active glycosides to the blend. In addition, motherwort, linden, oatstraw, and cramp bark have relaxing and antispasmodic properties that work wonderfully with hawthorn and ginkgo to aid a “stressed-out” heart. Violet is added for its nourishing vitamin and mineral content and for its beautiful heart-shaped leaves. 2. Stir well, cover, and steep 15 to 20 minutes. Drink two to three cups per day. Traditionally, these roots were brewed into old-fashioned root beer and imbibed as a healthful liver- and blood-cleansing beverage. Drink one to two cups per day for mild to moderate skin problems. 1. Combine the herbs in boiling water, reduce heat, and simmer for 15 to 20 minutes in a covered pot. 2. Remove from the heat and steep, covered, for 30 minutes. Here’s a blend that gently provides minerals for the entire body. All these herbs are nutritious and tend to be good sources of absorbable calcium, magnesium, iron, and other important trace minerals. Drink two to four cups per day as a gentle bone-building tonic. 1. Combine the herbs in a pot and cover with boiling water.